The very notion that words can make a world has its obvious root in the Hebrew of the first book of the Bible. It is there we learn that the word (davar), and the work and works (davar, davarim) of which all Scripture is both witness and legacy, are not something some of our fellow human beings made up. Neither human kings nor moguls of culture claim to have authored the world’s best selling book. Moreover, if a translation of the Scriptures into English has had an outstanding cultural influence, this is not simply a matter of shrewd marketing. Though the influence of the King James Version (KJV) has been extraordinarily far-reaching and formative, it will be clear that, as with all translations, the one which first appeared on May 5, 1611 was neither altogether original nor presumed to be perfect. Yet this single translation of the Bible became the authentic voice of Scripture for the English-speaking peoples worldwide for more than three centuries. From Britain to American, Canada, Australia, and even Africa and South-East Asia, for the sheep of innumerable flocks to hear their shepherd’s voice and recognize it trustingly was to hear it in this one English version above all others. The deliberately archaic “voice” of the KJV was a result of a decision to use certain older forms of formal English in preference to street idiom in the royal translation. This gave an effect of majesty to its phrasing, a dignity especially apparent in public reading, where the rhetorical character of literally rendered Hebrew made “Hebraisms” in English seem more naturally to express a divine quality in speech. That this effect, howsoever intended by the translators, was even better appreciated by royalists after Cromwell’s Puritan Commonwealth was defeated in 1660 was perhaps a consequence of political more than theological aims, but effectively the KJV translation privileged the language of the court. Yet rhetorical majesty was not an unwarranted inference from poetic portions of the Old Testament in which it is God who is represented as speaking, as a careful reading aloud of the passages given to God in the “whirlwind” speeches at the end of Job or in his “Comfort ye my people” speech in Isaiah 40 will make clear. The poetry of these speeches is “majestic,” as we say, and the KJV captures more of it than other English translations. G.F. Handel’s brilliant musical settings in his Messiah seasonally call this to mind even for those readers who turn no more to its “dated” pages. What has been lost to those who no longer read the KJV even silently is more than meets the eye. Oddly, part of what gives the KJV both its “high style” and its special theological register is an astonishing literal-mindedness. One example must here stand for many; we may consider a word which in the Hebrew of Exodus is likewise used in speeches ascribed to God, initially when he is indicating to Moses the special quality in Bezalel, son or Uri, to make him a fit workman to craft works of art suitable to adorn the tabernacle. This quality, as Hebrew renders it, is that of being chokma-lev, “wise-hearted”; the term usually appears as an adjective, but occasionally as a noun. The translators of the KJV chose, typically, to render it literally. Thus, kol chokma-lev, “all that are wise-hearted” (Ex. 31:6; cf. Ex. 35:25; 36:2) bespeaks qualities in an artist pertinent to the creation of a holy art, a special kind of spiritual wisdom. When NIV and NASB render this merely as “skill,” or the ESV as “ability” (another translation has “expertise”), or The Message as “aptitude for crafts,” their abstraction levels the higher sense of the Hebrew in a particularly dismal way; if we may shift to Greek to say so, what we have left on the page is only the techne, without the logos. When we look for other uses of this term in Old Testament Hebrew we find an echo in the very form of wisdom granted by God to Solomon; in response to the young king’s wish for the grace of chokma, “wisdom,” God gives him something more, the qualitatively richer chokma-lev, again translated literally by the KJV in such a way as to recall the instances in Exodus. So Solomon is given a lev chakam, a “wise heart” (1 Kings 3:12). He too, like Bezalel, will build a sanctuary for the Lord. If Professor Wrenn was right, this diminishment in our general language would help to account for the frustrations that, over the last century, have prompted some of the many new translations in English.5 Market opportunities for publishing companies have also been a factor in the extreme proliferation of translations. Similarly prolific have been the bowdlerized or caché editions with commentary attached. The “Revolve” Bible for teen and ‘tween’ girls, the “Green” Bible, “gay” Bible, prophetic Bibles, C.S. Lewis Bible, and even a “Princess Diana” Bible, all bear witness to something other than the desire for accurate understanding and holy instruction, however much that claim may be featured in the advertising. But translations themselves have become market adapted. Some have a political agenda, such as is instanced notably in the “Son and Crescent” Bible designed for use among Muslims.6 Other versions still more overtly expunge and recast original terms to effect a theological program, whether gender-inclusiveness in the case of the NRSV, or in the case of an adaptation of the KJV itself by Mormons, Latter Day Saints (LDS) contextualization. The latest version of the NIV modifies that released in 2005, in which the effort to incorporate gender-neutral language was seen by many in the pew as too extreme; the 2011 revision takes some of that back. The New American Bible recently approved by the U.S. Congregation of Catholic Bishops attempts to reflect current scholarly opinion and research in extensive (and often distracting) footnotes. In the Old Testament it also revises the language of its predecessor accordingly, and occasionally problematically; where the RSV followed the KJV in rendering Isaiah 7:14 to say “behold a virgin shall conceive,” the new text has, straightforwardly according to the Hebrew (but perhaps now in our loose culture misleadingly), “a young woman shall conceive.”7 Whatever the motivation, it is an awkward fact that we now have such an array of English translations available that the result has been a kind of babel-like confusion of tongues. A general effect of many such translations has been to level the resonant and poetic language of Scripture in the direction of contemporary vernacular, offering in the place of dignity or “majesty” a prosy, “accessible” but also unchallenging and ever-changing idiom of the marketplace. With the smaller-sized editions of 1613-1631, the KJV became more affordable; a modest householder for the first time in history might own a Bible. Even in families possessing but one book, this was the most common “library.” Here too, as in church, it was read aloud. Robert Burns’s eulogy for the “big ha’ -bible” in “The Cotter’s Saturday Night” bears a homely witness to the fact that generations of children learned to read from it. (Its phrases are everywhere in the American primer, known as McGuffy’s readers, cited there as illustrations for good grammar and eloquent rhetoric.) 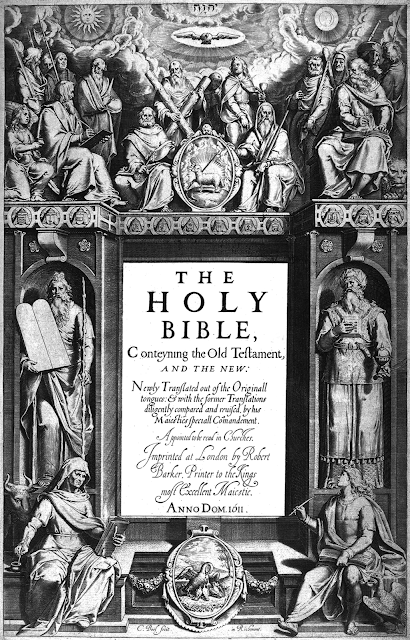 Moreover, when Bibles first began to be printed in America in the eighteenth century, the KJV ‘family Bible’ put family registers of marriages, births, and deaths between the conclusion of the Old Testament with the words of Malachi – in which God requires the turning of the generations to each other in reconciliation – and the opening genealogy of Jesus in the Gospel of Matthew, which commences the New Testament. American families learned in this way to see themselves as numbered among “the families of the earth” blessed in God’s promise to Abraham (Gen. 12:1-3). Ease of memorization is perhaps one of the most significant cultural as well as ecclesial evidences of the success of the KJV translators in making the language of Holy Writ, even in its admittedly archaic and magisterial phrasing, more natural and more widely efficacious for preserving biblical consciousness than any subsequent English translation. Here again the point is weightier than simply a matter of the problems of translation dissonance and linguistic interference; memory of the text is of the essence for a biblical culture. What Moses said in Deuteronomy (6:4-9) and what he reiterated memorably in his charge to Joshua, is that for the sepher Torah, the Book of the Law, to have its purpose realized in successive generations, it must be internalized in the hearts of a would-be godly people. Thus, his command: “This book of the law shall not depart out of thy mouth; but thou shalt meditate therein day or night, that thou mayest observe to do according to all that is written therein: for then thou shalt make thy way prosperous, and then thou shalt have good success” (Josh. 1:8, italics added). This injunction, reiterated in Psalm 1:2 as a condition of blessedness, and made graphic in the command to Ezekiel (Ezek. 1:3, 10) and John (Rev. 10:9-11) to “eat this scroll,” makes the point about memorization central to any abiding “legacy” or continuing influence of Scripture, and certainly with respect to “hearing truly the Word of the Lord”. When Jesus commands his disciples to “let these sayings sink down into your ears” (Luke 9:44), he is both drawing on and reiterating this condition for faithfulness (cf. John 8:31-32). In this context the KJV translators can be said to have provided for three centuries of English readers of the Bible a better means of effecting memorization than their successors, and in this sense too, their provision of a “common Bible” was an achievement of theological as well as cultural value. Memory – and forgetting – form a major theme in all of Scripture, and memory is invariably linked there with obedience as the sine qua non of faithful reading and cultural fruitfulness. Ironically, although the courtly diction of the KJV eventually led to the judgment of scholars and seminarians toward the end of the eighteenth century that the KJV translation was dated, it was actually the preference of “the middle and lower ranks” which helped maintain its position as the standard. But popular preference for the older KJV remained a point of principle also among high-culture figures such as Matthew Arnold, Sir Arthur Quiller-Couch, and T.S. Eliot, the latter of whom, as a poet might, resisted the “decadence” of language in such efforts as the New English Bible. Until the mid-twentieth century, in short, the base of support for the KJV translation of the Bible was both wide and deep. There are, of course, crude instances of bibliolatry associated with any populist fixation on a specific translation. It might be argued, as C.S. Lewis once did, that this impulse should be resisted by turning away even from what he saw as the seductive literary power of the KJV, and (as he perhaps too extremely judged), that this aesthetic predilection might be resisted best by a narrower estimate of the influence and value of King James language.10 But it would have been difficult to make that case in the African-American churches, where, among other achievements, it helped to produce the powerful rhetoric of Martin Luther King. There is much to ponder at a moment such as this, as we celebrate four centuries of a great vernacular translation of the Bible – perhaps the greatest ever since the beginning of modern times. We are, all of us, prone to want the words of Scripture to be a little less challenging, to say to us what we want to hear, what we prefer to believe. It is possible that King James himself, despite his own proclivities to self-interest, was apprehending just this tension between the reader and text when he wrote in his Basilikon Doran these words of caution to those whose habitual reading betrayed more interest in the familiarities of local culture than in the Word itself, “making the Scriptures to be read by their conscience, and not their conscience by the Scripture.”11 Such bias is a peril for translators and scholars as much as anyone. One may, I think, without excessive veneration, credit the translators of the KJV with having accomplished more than most in keeping to the right side of the trail in this regard. If the KJV has endured so long, surely this is part of the reason for it. David Jeffrey is Distinguished Fellow of Manuscript at Baylor University, Texas. 1. See David Lyle Jeffrey, “Habitual Music: The King James Bible and English Literature,” in David C. Burke, ed., Translation that Openeth the Window: Reflections on the History and Legacy of the King James Bible (Atlanta: Society for Biblical Literature, 2009), 181-97. 2. D. Seaborne Davies, The Bible and English Law (London: the Jewish Historical Society of England, 1954). 3. See Martin Medhurst, Before the Rhetorical Presidency (College Station: Texas A&M Press, 2008); also Preston Jones, The Highly Favored Nation: The Bible and Canadian Meaning, 1860-1900 (Washington, D.C.: University Press of America, 2007). 4. C.L. Wrenn, Word and Symbol: Studies in English Language (London: Longmans, 1967), 11. 5. Not, however, the Revised Standard Version, whose 1887 translators said in their preface: “We have had to study this great Version carefully and minutely, line by line; and the longer we have engaged upon it the more we have learned to admire its simplicity, its dignity, its power, its happy terms of expression, its general accuracy, and, we must not fail to add, the music of its cadences and the felicity of its rhythm. 6. See the article by Colin Hansen in Christianity Today 55.2 (February, 2011). 7. Problematic culturally: unlike the culture of biblical times, the expectation of virginity in a young woman is no longer reflexive. See the review by Michelle Boorstein, “Sign of the Times: Updated Bible,” Washington Post 3/8/2011. 8. “John Rainolds” article by Hugh Chisholm in Encyclopedia Brittanica, 11th edition (Cambridge: Cambridge University Press, 1911). 9 Another example of concern from a philologist in this period is that by Ian Robinson, in his detailed negative review of the Good News Bible, which he found diminished by its word choices not only divine but human transcendence. See his “The Word of God Now,” PN Review 6.5 (1980), esp. 26-27. 10. C.S. Lewis, The Literary Impact of the Authorized Version (London: Athlone Press, 1950). 11. Basilikon Doron (Edinburgh, 1599; London, 1603), 143.